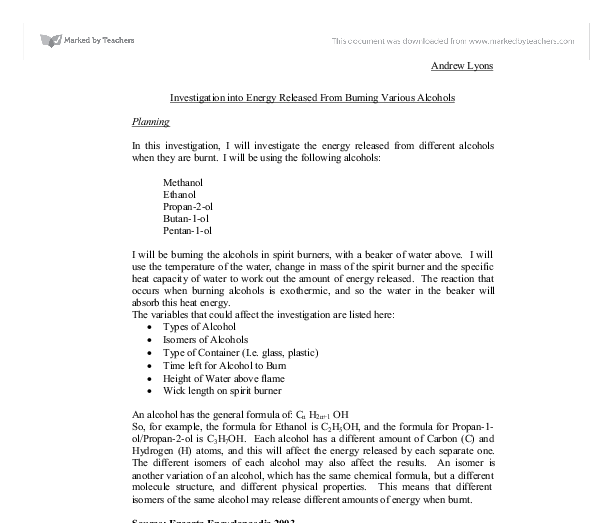 Investigation into Energy Released From Burning Various Alcohols. I will be burning the alcohols in spirit burners, with a beaker of water above. I will use the temperature of the water, change in mass of the spirit burner and the specific heat capacity of water to work out the amount of energy released. The reaction that occurs when burning alcohols is exothermic, and so the water in the beaker will absorb this heat energy. So, for example, the formula for Ethanol is C2H5OH, and the formula for Propan-1-ol/Propan-2-ol is C3H7OH. Each alcohol has a different amount of Carbon (C) and Hydrogen (H) atoms, and this will affect the energy released by each separate one. The different isomers of each alcohol may also affect the results. An isomer is another variation of an alcohol, which has the same chemical formula, but a different molecule structure, and different physical properties. This means that different isomers of the same alcohol may release different amounts of energy when burnt. The type of container will affect the results, and may make the test unfair. Some of the energy given off will be taken in by the container, and the material the container is made from will affect how much of the energy is absorbed. I will wait a few seconds, and then take a measure from the thermometer for temperature. I will then measure the mass of the spirit burner (making sure to keep the cap on). I will record both these values.I will repeat the above steps, using the alcohol methanol, two more times to get repeated results. When I have finished repeating the methanol results, I will collect a different spirit burner with ethanol in it. I will then repeat all of the above steps once more, but this time using ethanol rather than methanol.I will repeat the experiment using ethanol two more times after the first, and then move onto the next alcohol, propan-2-ol. When I have repeated propan-2-ol two more times after the first, I will move onto butan-1-ol. After three butan-1-ol results, I will move onto the final alcohol, pentan-1-ol.Once I have all my results recorded, I will clear away the apparatus. The water does not get too hot. The Bunsen burner and spirit burner are kept away from places where they may easily be knocked. The wick of the spirit burner is on firmly. If it is not, then it may catch fire. I will wear safety goggles to protect my eyes. Any loose bodily articles are firmly secured, so they do not set alight. The mass was measured with a precise balance for accurate results, and the temperature with a thermometer. To get the values for change in mass and temperature rise, I will subtract the lower value from the higher value. I would use the same isomer of alcohol each time, so that I would get consistent results. I would also measure the energy in other items such as the beaker, so that I could get much more accurate results, and this would allow me to form an even firmer conclusion. If I were to further extend this investigation, I could investigate the other variables. The main variable is isomers of the alcohols. The method for investigating isomers would be almost identical to this investigation. I would simply replace the 1-ol isomers with 2-ol. I would predict that the 2-ol isomers would release less energy than the 1-ol isomers. The results from this investigation suggest this, as more bonds must be broken, therefore using more energy. I would also compare the 2-ol results with the results from this investigation, and I would also work out new theoretical results so that I could form a conclusion, and see how the different isomers vary from each other. Another variable I could investigate is the time left for the alcohol to burn. To investigate this, I would use an identical set up to my current investigation. I would, however, repeat the investigation several times leaving the alcohol to burn for more or less time. I would have a range of results which I could compare to come to a conclusion. I would predict that as you increase the time left for the alcohol to burn, the energy released would increase. If you increase the burning time, then you are increasing the amount of time there is for reactions to take place, and more bonds will make and break. As you increase the number of bonds that are made, you also increase the energy that is released, as making bonds releases energy. 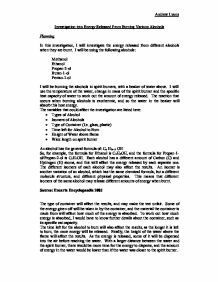 This student written piece of work is one of many that can be found in our GCSE Electricity and Magnetism section. **** A sound report that has made good use of the collected data but could be improved by greater consideration being given to the evaluation. The plan needs a thorough risk assessment to be included. It would help if greater consideration were given to how to limit heat loss in the experiment during the planning stage. Valid data seems to have been recorded but some headings in tables are misleading or missing key columns and units. The values calculated do not seem to agree with published data. The conclusion makes some reference to the relevant scientific theory and refers to possible anomalies. Whilst there are some ideas for extending the work there are no suggestions included that would modify the apparatus to help improve the main problem of heat loss. If you work this out it comes to an extra 618kJ/mol of energy released. So, in theory a graph of energy against number of carbon atoms should be a straight line. Also, the final amount of energy is given as a negative number. Electromagnets - What factors affect strength of an electromagnet? Record the number of paperclips picked up 12. Repeat each experiment three times, with different current values to get an average result. Diagram 2, showing the position of the apparatus for experiment two Safety measures Safety is needed during any type of experiment carried out. increased as temperature increases Objectives From the preliminary trials we are trying to determine the final circuit diagram, to do this we are tying to decide on the best and most suitable equipment for the investigation for example we are trying to find out which is the best power source to use out of a cell and a battery. 'The Effect of heat on a Squash Ball'. this could have been due to misreading of the ruler or heating of the water to long. So I decided that I would get the two results, which I thought could not be out of proportion and got the average out of them two. kinetic energy will be required to turn the motor's 'spindle' to lift the weight. An increase in the amount of rotational kinetic energy being transferred must also result in: * An increase in friction affecting the motor's moving parts, causing energy to be wasted in the forms of heat and sound. An in Investigation into the Resistance of a Wire. These electrons travel at a steady pace, when they come to different piece of wire, they have to slow down in order to be able to pass (different wire meaning the actual wire being used and the wires connecting the apparatus). We held the first crisp in the flame and as soon as it's alight we held it directly under the test tube with tweezers. We then stirred the water and recorded the temperature again after the flame on the crisp had died. in different places, so the actual result looked different, depending on where people were standing. I also discovered from this experiment, that piling rulers on top of each other doesn't work. They have to be firmly secured or held by two people.